Mr. Kan is the Founder, Chairman, Chief Executive Officer and Executive Director of our Group. He is mainly responsible for managing the overall operations of our Group and planning our business development and strategies, in particular, overseeing the business activities of our Group, supervising the operations and resources allocation of our Group and driving our Group to attain performance targets. Mr. Kan has over 30 years of experience in the fine jewellery industry. Currently, he is the president of the Hong Kong Gold and Silver Ornament Workers and Merchants General Union, the first honorary president of the Hong Kong Gemstone Manufacturers’ Association, the honorary president of the Hong Kong Jade Association, the honorary president of Hong Kong Pearl Association; the honorary president of Foshan Shunde Jewelry Chamber of Commerce, the honorary adviser of All-China Chamber of Commerce for Jewelry & Precious Metals Industry, the vice president of the Wuyi Assoication of Hong Kong and the CPPCC member of Jiangmen Xinhui District Chinese People’s Political Consultative Conference. Ms. Shek is the Executive Director of our Group and mainly responsible for managing the sales operations of our Group, in particular, overseeing the sales activities of our Group, leading our sales team to attain sales targets and devising sales plans based on the varying demands and customer behaviors in different markets. Mrs. Kan has over 25 years of experience in the fine jewellery industry. Mr. Chung is the Executive Director of our Group. He is mainly responsible for the management of our Group. Mr. Chung has over 30 years of experience in the accounting industry. He has a higher stage certificate for proficiency in accounting and a certificate of proficiency in cost accounting, both issued by the London Chamber of Commerce and Industry, respectively. Mr. Fan is the Independent Non-executive Director of our Group. Mr. Fan was made a Justice of the Peace in 1993. He awarded the Badge of Honour, Bronze Bauhinia Star and the Silver Bauhinia Star afterwards. 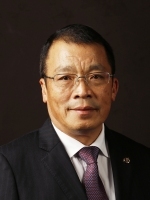 Mr. Li is the Independent Non-executive Director of our Group. Currently, Mr. Li is the senior partner of Li and Lai, a firm of solicitors in Hong Kong. He was admitted a solicitor of the High Court of Hong Kong in 2003 . He has a bachelor’s degree in social science from the Chinese University of Hong Kong, a bachelor’s degree in laws from the University of London and postgraduate certificate in laws issued by the University of Hong Kong. Mr. Wong is the Independent Non-executive Director of our Group. Currently, Mr. Wong is a fellow of the Hong Kong Institute of Certified Public Accountants and a fellow of the Institute of Chartered Accountants in England and Wales. Mr. Wong has over 30 years of experience in accounting, finance, audit, tax and corporate finance with an international certified public accountant firm and listed companies in the United Kingdom, New Zealand, Hong Kong and Thailand. Mr. Wong has a master’s degree in electronic commerce from Edith Cowan University in Australia. Mr. Tam holds a master degree of business administration and is also a member of Hong Kong Institute of Certified Public Accountants, CPA (Australia) and Institute of Singapore Chartered Account ants. Mr. Tam has more than 20 years of experience in the areas of auditing, accounting, tax, investment banking and company secretarial works. Ms. Kong is the Human Resources and Administrative Director of our Group and mainly responsible for human resources and administrative matters. Ms. Kong has a diploma in business administration by the Hong Kong Shue Yan University and a bachelor’s degree in business administration from the Open University of Hong Kong.